Welcome to Top 10 Tuesday: What I'm Listening To! I like to consume my paranormal information and news in a variety of ways---reading books and articles, perusing Facebook groups and websites, watching documentaries and the occasional television show, discussing and debating with fellow researchers, attending lectures and conferences, and...listening the heck out of some paranormal podcasts and radio shows! I've recently fallen in love with listening to paranormal podcasts and radio shows. They're a great way to make use of time while driving, cleaning up around the house, or crafting. And, there are so many awesome different shows out there, available to listen to for FREE! 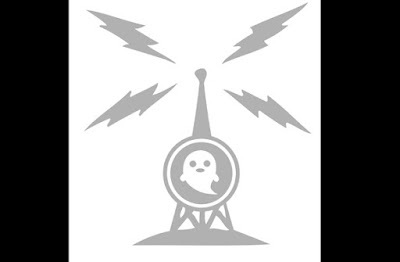 In no particular order, here are ten awesome paranormal-themed podcasts or radio shows that I've been listening to recently. 1. Paraversal Universe--This is one of my all-time favorite paranormal radio shows as they air a variety of different paranormal topics and interview a wide array of paranormal researchers. The show airs Friday nights at 8 pm EST on the Paranormal King radio network, and is hosted by Kevin Malek and Jennifer Scelsi, both of the Northern Wisconsin Paranormal Society. You might remember that I got to be a guest on the show earlier in 2015! Archives can be found HERE. 2. Lore--My boyfriend recently introduced me to this relatively new podcast by Aaron Mahnke. These are short little shows exploring hauntings, urban legends, weird historical events, and folklore. Mahnke does an excellent job with his research and the shows are presented very well---they are never boring or dry, but totally entertaining. 3. Real Paranormal Activity Podcast--You can listen to this show directly off the website (just scroll down), or on a variety of different media, including YouTube and iTunes. Lots of reader submissions of scary stories, interviews, and more. 4. Into the Fray--Hosts Shannon Legro, Ryan Sprague and Sam Shearon discuss tons of different paranormal topics and areas of interests. They recently did a show featuring a Bigfoot witness here in West Virginia! 5. Coast to Coast AM--This is one of the few radio shows I listen to live...when I can stay up that late! Since my local station here that carried the show switched formats, I've found the easiest way to tune in is through the awesome app/website TuneIn Radio. No one can ever replace Art, but I do like George Noory and most of the other hosts. However, I have found myself picking and choosing which episodes to listen to...it seems like more and more don't deal with strictly the paranormal anymore. Rather, topics such as holistic living and things of an almost political nature are coming up more and more. 6. Real Ghost Stories--I prefer to listen/watch this podcast, featuring plenty of real life ghost tales as told by those who experienced them, through their YouTube channel. Hosted by Tony Brueski, there are tons of archived shows waiting to be listened to! 7. The Unexplained--Hosted by Howard Hughes, this UK-based podcast has been one of my longest listened to favorites. You can download or stream off the website to listen to Howard interview guests such as Linda Moulton Howe, Graham Hancock, David Paulides, and many more. 8. The Paranormal Podcast--Jim Harold hosts this widely popular podcast, which you can stream from his website, or download through a variety of channels. Recent shows include 2016 Astrology with Maria DeSimone, Haunted Christmas and Christmas Angels, and Cinema Symbolism. 9. Living Paranormal--You might remember that Carrie and I were on Living Paranormal earlier in 2015! This awesome show is hosted by Jason Olivo and local investigator, Rob Henry, of the Original WV Paranormal. You can listen to the show live (check Facebook for schedule) or stream archived shows from the website. 10. The Squatcher's Lounge Podcast--For all you Squatchers out there, here's the Squatcher's Lounge Podcast's YouTube channel. Awesome eyewitness stories and much more of interest to fans of the hairy men. Did I miss YOUR favorite paranormal radio show or podcast? Head on over to Theresa's Haunted History of the Tri-State Facebook page to share your favorites! What is the Paranormal Lecture Series?